When it comes to hair loss and thinning hair there are often underlying health issues that may be related for me it is poly cystic ovary syndrome. PCOS is hormonal related which means hair can become thinner in some places and appear in some places that often they normally wouldn't. When my PCOS flairs up I can find that my hair will thin out which can be really upsetting but over the years I have become more comfortable with ways to combat this. I want to share a few ways you Can improve thinning hair and the other options that are available. I have always had fine hair so have experimented with lots of products and feel that the best results come from using a good volumising Shampoo. I really love the results I get with either the Pantene Volume or the Loreal fibrology ranges . I tend to rotate the two as it is better for your hair to make sure you're not always using the same hair care products. Also when conditioning your hair it is best to use as little a possible on the roots and focus more on the ends as too much conditioner can often weigh thin hair down and leave it looking lank and greasy even after a wash. I try to use as little heat on my hair as possible never using the hottest settings on the blow dryer. Don't be afraid to let your hair dry naturally patting with a towel and using a wide tooth comb to detangle with a light detangling product that is specifically for thinner hair. A good hairdresser is one that knows how to work with your hair type, even better if they have the same kind of hair as you as they can give you some amazing first hand tips on how to keep your hair looking the best it can for the results you want. Layers are a fine haired grrrls best friend as they add more texture and definition to your hair making it appear thicker than it actually is. Keeping your hair at a manageable length will also help as the longer your hair is the heavier it will become and can then have a tendency to fall more than if you keep it at a mid length which gives you more freedom to play around with hairstyles. A good curl always adds a bit of thickness, I like to experiment with heat less curling methods as it puts less stress on your hair. There are lots of products to help achieve a fuller look for example hair donuts can make a bun of dreams. Stress can also be linked to hair loss and the more you panic about your locks the more you will lose. Some believe that a good head massage can help de-stress and may actually have some success in helping your hair grow a little thicker. The theory is that a massage can help increase blood circulation to your scalp which will then in turn help the strength of the hair roots. Find a good local massage therapist or even get your partner to use an oil to massage your scalp to help nourish your hair. Not only will this help your hair become healthier but you will also feel totally relaxed and hopefully lift some tension. If you have tried all of above and are still really struggling a confidence lifter can come in the form of a good wig. Wigs have become super affordable and a re a great way of trying out a style especially fun colours that you may not want to commit to all the time. However wearing wigs constantly can also restrict your hair growth so make sure you allow days off or just reserve them for special occasions. There are lots of treatments available, some are firm believers in steroid injections which can be painful but in extreme hair loss cases this may feel like an option you want to explore. Steroids can also be used in a tablet form. Hair transplants may also be an option, a new procedure FUE transplant is becoming more popular. FUE stands for follicular unit extraction in which a donor allows hair follicles to be removed and implanted onto a recipient. This is a very interesting procedure carried out by a doctor using powerful microscopes mapping your hair growth and placing the follicles to match and look more natural. As this becomes more popular it isn't just the celebrities that can now afford such a luxury treatment, hair transplant costs are becoming more affordable and accessible. Do you have any tips for thinning hair? Great tips i have PCOS too and have such fine hair. 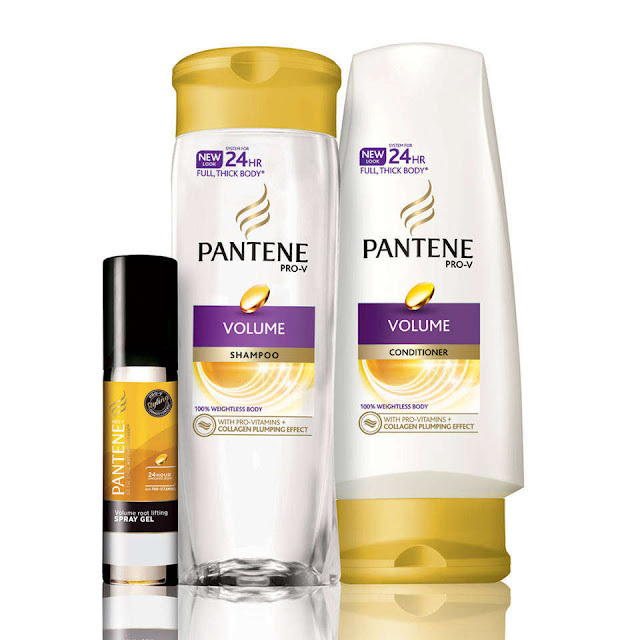 I love all of the Pantene hair wash ranges! I have thick hair so I don't have these issues but your tip about a good hairdresser is so true!! It makes such a difference. My hair is really thin and getting worse!! Since I had the kids I barely have any left, I so need to try these! Thanks for these great tips though I have no problem with my hair yet I'll keep this in mind. Totally agree with relaxing as I believe stress really contributes to the thinning of hair. These are some fabulous tips, I have massively thick hair but I agree with getting a good hair dresser! These all sound great tips. I'm suffering with hair loss at the moment due to thyroid disease, it's so stressful and upsetting isn't it. I'll definitely give some of these a go. Thank you. These are great tips, my hair seems to be thinning a lot lately so I'm going to try these. I remember how thin my hair got after having three children. I ended up shaving it all off and letting it regrow! Heard good things about Pantene Volume. Thinning hair is something serious, we should really find the best product to help us with this dilemma. These sound like great tips! I'll pass them on to my mom who has thinning hair. My hair is very thin, so I can always do with tips to make it look thinner and with more volume! I am also facing hair thinning. I lost almost half of my hair in last two years. But I agree head massage helps a lot. I also try some home remedies which slow the process but I am not very regular with them. Great tips though.